A new book captures the drama and excitement of one of the world's longest-running independence struggles, while also providing a strategic vision for success. Although West Papua is less than 80 miles from Boigu Island, Australia’s northern point, very few Australians know much about it. It is a beautiful land, but it is shrouded in secrecy. Part of the secrecy arises because it is currently under militarily occupation by Indonesia. The Indonesian government has enforced a policy to keep foreign journalists out of West Papua in an effort to prevent stories of human rights abuses, economic exploitation, and lack of health and educational services, which are being experienced by indigenous Papuans, from reaching the outside world. 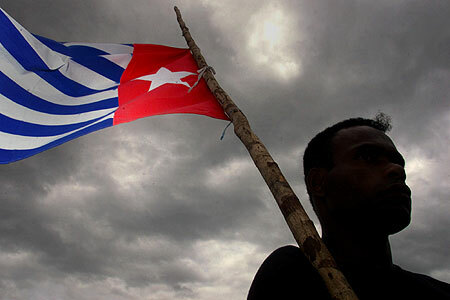 The Indonesian authorities do not want others to know of Papuan struggles to achieve merdeka — a word in the Indonesian and Malay language for independence, liberation, identity, human dignity, self-reliance, material and spiritual satisfaction. Jason MacLeod, a Quaker educator, organizer and researcher, has written an astounding book — “Merdeka and the Morning Star: Civil Resistance in West Papua” — in which he gives an in-depth analysis of this struggle, the most protracted violent conflict in the Pacific. He writes from both an academic and a practitioner viewpoint. He tells that as a 19-year old he dropped out of university and traveled to Papua New Guinea in search of adventure. In a remote area on the Keram River he collapsed with cerebral malaria, and it was only because of the efforts of two Papuan health workers that his life was spared. This experience led him to a life’s journey of solidarity with the Papuan people. His research is based on 14 years of interviews with over 150 groups and individuals, participant observation and dialogue, and the facilitation of skill-building community workshops on strategic nonviolent action with over 450 Papuan activists. Crucially, it is also informed by current theory of civil resistance. He begins by relating the historical and political background to the conflict. Belatedly, in 1961, the Dutch created a Papuan national legislature and the Morning Star flag was adopted by the Papuans as their symbol. These events led to an invasion of West Papua by Indonesia, and in 1962 the Kennedy administration brokered the New York Agreement, which gave Indonesia administrative control of West Papua. The Papuans were not involved, nor consulted, in this process. Under the New York Agreement, a referendum for self-determination was to be carried out, but instead of allowing universal adult suffrage, Indonesian authorities handpicked 1,025 participants. Then the military terrorized villagers and executed those who dissented — declaring, at that point, that Papuans were 100 percent in favor of integration with Indonesia. The result was not challenged at the time or later. The Indonesian government interprets their control of West Papua as being sanctioned by the United Nations, while the overwhelming majority of Papuans feel the process was a sham and they have not been given a chance to choose whether or not they wish to be part of Indonesia. Resolution of the problem is very complex. Aside from the denial of self-determination, the issues of racism, state violence (over 100,000 Papuans are estimated to have been killed), economic exploitation (e.g. large-scale projects like the Freeport-McMoRan/Rio Tinto mine, and logging) and migration (estimated to reduce the Papuan population from 96 percent in 1971 to just 29 percent by 2020) add interactive layers of direct, structural and cultural violence. MacLeod quotes research by Erica Chenoweth and Maria Stephan’s 2011 book Why Civil Resistance Works, showing that nonviolent campaigns are more than twice as effective than violent campaigns in achieving national liberation, democracy and equal rights. But secession struggles against occupation are more difficult, and the chances of fully achieving success for either violent or nonviolent campaigns fall dramatically. After exploring the dimensions of problem, MacLeod outlines the sources of Indonesian power in West Papua and the strategies employed to maintain state control. This perceptive analysis of the root causes of the conflict, the opponent’s sources of power and their strategies of rule provides essential information to develop civil resistance strategy. Papuan civil resistance has a long, largely unknown history stretching back to the 1850s. 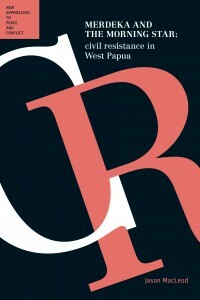 Making these stories known, stories that give a collective identity to Papuans and strengthen civil resistance, was a prime reason why MacLeod wrote this book. He provides a critical analysis of the strategies, as well as the successes and failures of case studies, missed opportunities and the evolution from sporadic protests to unified campaigns. Over time there has been a transition from armed struggle in the mountains or jungles of the interior towards unarmed resistance in urban areas, carried out by younger Papuans. MacLeod provides an analysis of the dynamics, which has led to these shifts, a transition that is still going on. In his last chapter MacLeod offers a framework for nonviolent liberation. He argues that success hinges on increased movement participation, enhanced strategic skillfulness, greater unity, the ability to attract greater support from within Indonesia and also internationally, and taking advantage of political opportunities. He admits the immense difficulty of the task, but affirms that civil resistance has already achieved some notable advances. For example, Papuans launched a widespread and successful campaign to sink plans for a third province; Papuan women market-sellers’ launched a campaign to establish their own marketplace in Jayapura, the capital; and Papuan landowners and environmentalists ousted BHP Billiton and its plans to build a nickel smelter on Gag Island in Raja Ampat, the world’s most diverse marine environment. In 2007, there was a massive strike by Freeport mine workers, which saw the formation of the first independent trade union in West Papua and brought 40 percent participation — including highlanders, islanders and migrant workers — to win a 98 percent wage increase for the lowest paid mine workers. Another successful strike in 2011 had 52 percent participation and increased the number of international allies. Finally, and most recently, MacLeod captures the drama and excitement of events leading up to the 2015 United Liberation Movement of West Papua’s application for membership to the Melanesian Spearhead Group, or MSG [read about this case in a published excerpt]. This action represents the internationalizing of the West Papuan issue, which is exactly what Jakarta was trying to avoid. 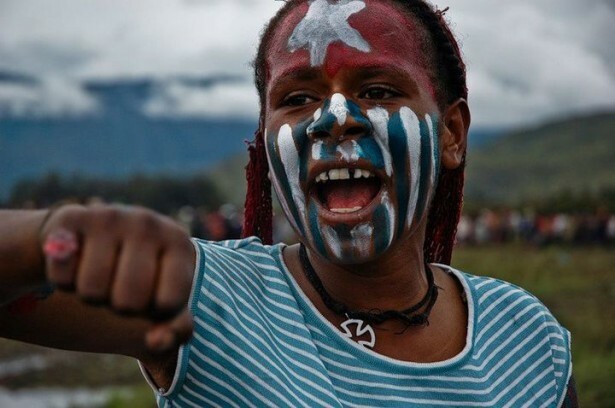 “Merdeka and the Morning Star” gives a discerning overview of the current situation in West Papua and provides a vision of the potential of nonviolent civil resistance. It lifts the veil of secrecy of the injustice and violence inflicted on the Papuan people in this troubled land, and allows us to hear their cry for merdeka. But the struggle will be long and difficult, more difficult than bringing down a dictator, because it must be waged in three places simultaneously — within West Papua, within the centers of power and the society of Indonesia, and internationally. It is further complicated by the immense wealth of West Papua, which brings in entrenched interests of the Indonesian government, the Indonesian military and intelligence services, and transnational corporations. The struggle must also confront the underlying issue, which is the basis of occupation: the issue of racism. MacLeod offers hope to Papuans in their struggle by giving a strategic framework to understand how civil resistance works and what needs to be done to achieve success. It does this by pushing our thinking about the elements of waging nonviolence in secessionist or self-determination contexts; bringing together insights from community organizing and civil resistance mobilizing in the context of an anti-colonial struggle; integrating insights from theories on revolution; and articulating a methodology for participatory action research of civil resistance struggles. It should also be of help to people waging anti-colonial struggles in places such as Palestine, Tibet, Kanaky, Maohi Nui, Nagaland, Western Sahara and elsewhere. It also encourages outsiders to become involved in the movement and to explore what it might mean to accompany West Papuans and others, living under occupation, in their nonviolent struggle for peace and justice. Dale Hess is a member of Victoria Regional Meeting of the Religious Society of Friends and lives in Bun wurrung country (Melbourne) in Australia. In 2015, he travelled with a Quaker-led Peace Pilgrimage to West Papua. Jason is to be commended for communing and gaining a West Papuan view of this tragic situation. But if we wish to be good friends, we must be willing to understand the cause of this tragedy which is in the United States and not West Papua or the Indonesian military that is taking advantage of the current illegal and immoral American scheme. Thankfully the situation can be peacefully resolved if readers are willing to act for the common good rather than being passive by standers. Both Indonesia and the corporations exploiting West Papua want the public to believe a myth that the ‘New York Agreement’ was in response to an Indonesian invasion, and that it was transferring administration to Indonesia. This self-serving lie has been reinforced by a misleading title over the document and misleading news reports issued before journalists and lawyers could analyse what America was asking the United Nations to do. This gave Indonesia time to land sufficient troops to allow the US to sway the Netherlands to sign the agreement in 1962 which the US and Indonesia had been privately negotiating. Legally there is nothing wrong or improper with the New York Agreement apart from the questionable intent of concealing its legal function from the public. The problem that is still killing people in West Papua is that the public did not know that the West Papua became an United Nations trust territory and that the new Secretary General & subsequent Secretary Generals have each failed to perform their duty under UN Charter article 85 of telling the Trusteeship Council about the General Assembly approval of a UN trusteeship in General Assembly resolution 1752. Due to this failure to put the issue of resolution 1752 on Trusteeship Council’s agenda, the Council has been unable to begin its legal duties of reporting events in West Papua to the United Nations for the past fifty four years under UN Charter article 85 part 2, article 87, and article 88. I fear that our friends in West Papua by their nature are a trusting people, hopeful that God will hear, and perhaps too trusting of some on earth. Our governments voted to send foreign troops from Pakistan and Indonesia to ‘administrate’ West Papua and therefore we have an obligation under UN Charter article 76 which our governments have been tragically ignoring. #93 BC Bob: Understood.UBS closed their muni bond dept yesterday. The 280+ people laid off started getting their severance packages yesterday form HR. I am told it was incredibly sad at 1285 Ave of the Americas yesterday (understandly so).Also most of Bear Stearns muni employees were let go earlier this week, in addition to a chunk of JP Morgan’s muni people.All and all a bad week for the muni business.